Rapper Soulja Boy has apologised to fans after he was released on bail following his arrest in Georgia on Tuesday – 18 Oct. 2011. The 21-year-old hip-hop star (real name DeAndre Cortez Way) was detained on suspicion of drug possession after cops stopped and searched the car he was travelling in. The officers allegedly found marijuana, cash and a number of guns inside the vehicle. The rapper was taken to Caroll County Jail along with four other men and they were all booked for marijuana possession and a gun charge – according to Tmz.com. They were later released after posting a bail bond. 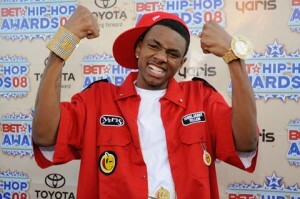 Following his release, Soulja Boy took to his Twitter.com page to tell fans about the incident, revealing the arrest forced him to miss a number of interviews to promote the Dvd release of Soulja Boy – The Movie. He also thanked his supporters who waited for him outside the jail. Rapper Soulja Boy was arrested on drug and weapons charges on Tuesday after a traffic stop in Georgia – police said. The 21-year-old entertainer, whose given name is DeAndre Cortez Way, and four crew members traveling in a Cadillac Escalade were pulled over in Temple, Georgia on Interstate 20 near the Alabama line – police spokeswoman Dana Rampy said. Police discovered marijuana, pistols and cash inside the car after a “routine traffic stop” – Rampy said. She declined to disclose the amount of marijuana or money. The rapper, three bodyguards and a driver each were arrested on felony charges of possession of marijuana, possession of marijuana with intent to distribute and possession of a firearm – Rampy said. All five men were booked into the Carroll County jail. A puppy found in the car has been turned over to relatives of the driver – Rampy said. Soulja Boy first gained fame with online postings of his songs and his “Crank That” dance demonstration. Soulja Boy’s ‘pretty boy swag’ landed him in jail on Tuesday, after US police discovered drugs and weapons in his rented SUV. The rapper was arrested and held on a 10,000 dollars bond following a traffic stop that found guns and marijuana, as well as a puppy, in his Cadillac Escalade. The 21-year-old was on his way to Mississippi around 2:30 am on Tuesday, travelling through the town of Temple, Georgia. Police noticed one of his tail lights wasn’t working, according to reports. Officers pulled the vehicle over, discovering three firearms, five ounces of marijuana and 46,000 dollars in cash – according to CBS Atlanta. Soulja Boy (whose real name is DeAndre Cortez Way) was arrested along with his three bodyguards and driver. All were charged with felony possession of marijuana, possession of marijuana with intent to distribute and possession of a firearm during the commission of a crime. This entry was posted on Wednesday, October 19th, 2011 at 8:15 am	and is filed under Celebrities. You can follow any responses to this entry through the RSS 2.0 feed. Both comments and pings are currently closed.